It was somewhat amazing to watch at Thursday's St. Pete City Council meeting as Pier Park simply shrank right before the City Council's eyes and no one even mentioned: bait and switch, change of scope, what will it really look like or can we have a look at what the real renderings will look like. The footprint had already shrunk by almost 25% or so to get some hope of permitting and those towering trees that looked like 30 foot Oaks, quietly shrunk to 30 foot native plants, make that palm trees. The real issue here is City Council may have bought themselves a $33,000,000 pig in a poke. Forget the inverted pyramid, what will this thing really look like? The Kriseman administration will get a deal on Pier Park if Mike Connors has to unload the dirt for the event field from the truck himself with a shovel and a wheel barrow to make the budget. 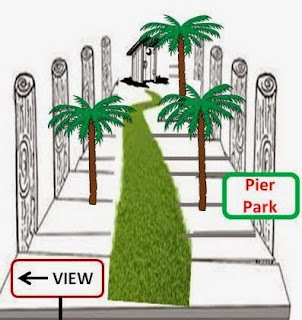 Under no circumstances, at any cost, for any reason, no matter what, come hell or high water these negotiations with the Pier Park group cannot fail because the State Statute requires that if they do the City MUST negotiate with the second ranked and that is Destination Pier. From the Kriseman administration's position that cannot happen! This deal will be filled with enough holes to embarrass a sieve. The City will pony up "in kind" services, provide "staff support", agree to "finish" certain parts of the structure, "haul away debris at City cost or no cost for undefined "City Purposes", waive permitting costs on an on the list will go. Pier Park could not be permitted and most likely not built within the budget as originally designed. As the wheeling and dealing begin in the design phase the real question is who is watching the chickens and the answer is the silver haired fox.